Lean ground turkey is a healthful alternative to fattier beef. The only problem is it tastes like it. 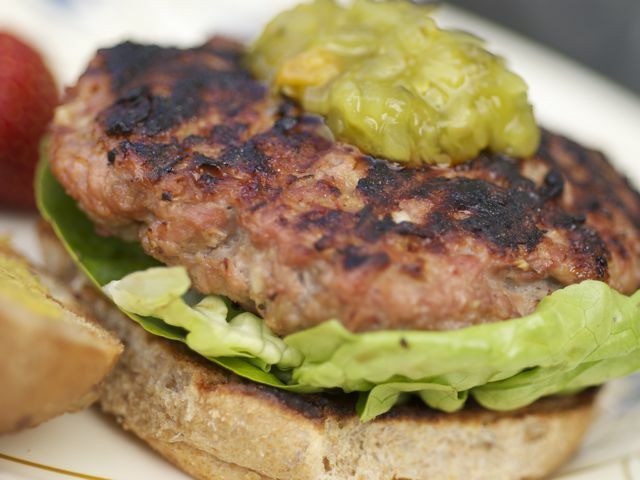 Naturally dry and mild, turkey burgers just come off wimpy when your mouth's attuned to beef. But that won't stop the true grill master. Such deficiencies are nothing more than the next grilling challenge. These burgers are awesome — rich and moist and dripping with flavor. Light a grill for direct medium-high heat, about 425 degrees. Combine the turkey, apple butter, ketchup, onion, seasoning, and breadcrumbs in a small mixing bowl. Season with salt and pepper, then, using your hands, mix gently. Form into four patties, no more than ¾-inch thick. Brush the grill grate and coat with oil. Put the burgers on the grill and cook for 9 minutes, flipping after 5 minutes for medium-done (slightly pink, 150 degrees on an instant-read thermometer). Add a minute per side for medium-well done (160 degrees). When serving, if the burgers will sit, even for a few minutes, keep them and the buns separate until just before serving.